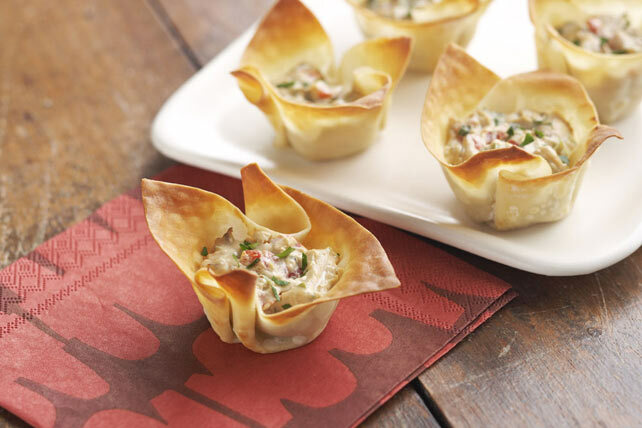 Whenever we use won ton wrappers for bite-size appetizers, the recipes are a hit. So, here's one more party-perfect appetizer recipe that's sure to be as popular as all of the rest. Place 1 won ton wrapper in each of 24 mini muffin pan cups sprayed with cooking spray, extending edges of wrappers over tops of cups. Bake 5 min. Meanwhile, mix remaining ingredients until well blended. Spoon about 1 Tbsp. cream cheese mixture into each won ton cup. Sprinkle 2 Tbsp. finely chopped fresh parsley evenly over baked won ton cups before serving. These easy-to-make won ton cups can be part of a healthful eating plan.